Spark York is an allegedly temporary project run by a group of hipsters on Piccadilly, York. They have built a space up using shipping containers, scaffolding and wooden boards. It has craft beer, street food and even a vintage clothes shop. They also host music events and community events. Yeah that does all scream hipster, but as I walked round on a bright summer’s day (not pictured, I took the pictures a few days later!) it does seem like a nice place to sit with a pint. The decked area actually reminded me of childhood holidays in Skegness (probably not the vibe they were going for!) and the place is a perfect sun trap! The food smells great and the drinks look very tempting. So is this a place I would sit and chill? Probably not! Whilst the food and drink is no doubt high quality, it all looks very pricey. From what I understand the owners are a bit greedy when it comes to renting essentially a metal box away from the main tourist footfall of town, and this gets passed on to the customers. With Brew York just around the corner, I’d probably just go there and my beer money will last way longer! Honestly, I just feel sorry for the traders. Whilst it’s heaving on a warm summers evening and weekend, I’m not sure how well this venue is going to do in winter, even with their canvas roof. Time will tell. They also only have a short lease on the land. So today I’ve got to playtest the Family Ties Expansion, alongside the GR-75 conversion and the BFF-1 kit. Not going to do a full write up as I am suffering from trapped nerves affecting my arms and hands, so I am trying to minimize my computer time. I now have a big enough table to play epic at home. 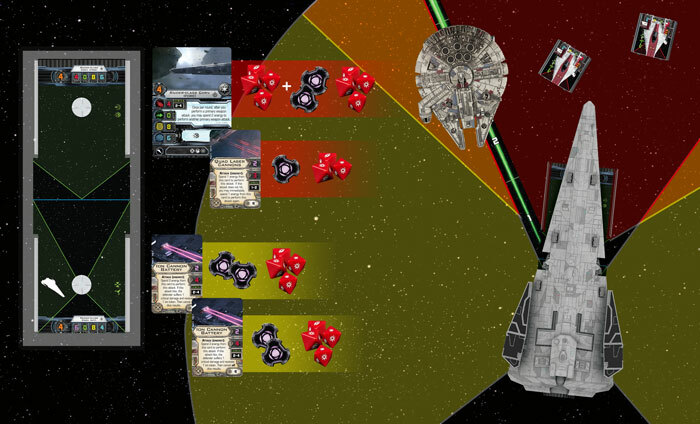 I took a list that was as close to the X-Wing Alliance game as I could get, and Spencer brought an ace heavy list (the kind I like to fly against.) It was quite slow at first as neither of our red dice rolled particularly well. Spencer took out Emamon Azameen, then I took out one of his Jumpmasters. Then he slowly started picking off my ships one by one, resulting in a big victory for Spencer. I don’t mind loosing with custom ships as it proves they are not overpowered. I think a non-story based list with some of these ships would do well – for example Zuckuss crew on the Otana would be incredibly useful. Looking forward to running some of the Family Ties expansion again and a rematch! Not going to lie, I haven’t travelled the whole of the UK, and I may be a little biased as I love York (some would say too much…), but here is my pitch on why I feel the walled City of York is the geek capital of the UK! OG Games – OG Games is one of two specialist board and card gaming stores in York. Established in 2015, OG Games brought York it’s first store with a dedicated gaming space. They have dedicated gaming nights four nights a week, the lineup which has rotated somewhat with demand, but currently it hosts X-Wing & Imperial Assault, Yu-Gi-Oh, Netrunner, Dice Masters, Star Wars Destiny, Friday Night Magic and Pokemon TGC. They stock a wider range than this, and do demo games for new products. They also do regular tournaments where you can win prizes from the publishers tournament kits. You can find more about their gaming events here. OG Games is located on a little alleyway between The Shambles and Whip-Ma-Whop-Ma-Gate. Travelling Man – Travelling Man is the other specialist board and card gaming store, and is also a comic book store. In 2016, they moved to a bigger store and have expanded their stock massively. They also have a gaming space, and have held events in external venues before the move such as world boardgame day events and boardgames nights at the Ackhorne pub. They now have in-store gaming events and tournaments with tournament kits, an annual geek bizarre, and a community comic library is planned. They also have comic book signings and chances to meet the author. They have a number of different groups to co-ordinate their events, so the best way to stay up to date is to go in store or have a search on Facebook. Travelling Man are located on Goodramgate, a few doors down from their old store. The Shop That Must Not be Named – A sister shop from the people behind GTDAB, TSTMNBN sells only Harry Potter merchandise on The Shambles, the historic street which inspired Diagon Alley. Seeing a business opportunity that the success of this shop has enjoyed, a company that runs gift shops across the Country has bought two shops opposite each other on the Shambles and turned both of these into Harry Potter shops as well. Yeah, I don’t get why he needs two either… On a related note, the metal bridge in York station is the bridge in Harry Potter and the Philosopher’s Stone where Hagrid talking to Harry at King’s Cross station was filmed. Belong – GAME have opened up one of their BELONG gaming arenas in York. They have PC’s, PS4’s and XBox Ones you an play on for an hourly charge. They have themed nights such as Overwatch night, and it looks like they are trying to get a community going. Another gaming cafe had launched a Kickstarter but has cancelled as the market is getting quite crowded, and rumour had it a different boardgames cafe was planned to open in October. And finally, in November 2017 a Kickstarter appeared for a Fantasy themed bar in York, the Quest Inn. The plan is to open in 2019, and you can read more about it here. In the meantime, The Royal Oak on Goodramgate has a private function room which is perfect if you need somewhere private to hold a geek event. And whilst not technically geeky, Thomas’ of York is a fantastic pub where some of my friends have gone to play their own boardgames before. It describes itself as ‘York’s Quirkiest Pub’, it also does amazing food and drink, has a variety of events on, is friendly and welcoming and also very supportive of the LGQBT community. Beyond Monopoly – A boardgames club where you can go and play- well, boardgames that aren’t just your standard fare. They meet four times a week and have a small entrance fee. They have a stock of games or you can bring your own. York Wargames Society – York Wargames Society offers tabletop miniatures games as well as roleplay groups. Based at Guppy’s Enterprise Club just outside the City walls, they offer a space to game several times a week for a small membership and entrance fee. You can try your first two sessions for free to see if you like the club. York Garrison Wargaming club- York Garrison is based in the Folk Hall at New Earswick, a self-contained village on the edge of York. They meet on a Wednesday night and one Saturday a month for longer sessions. The first session is free, and after that you can join for just £1 with a small fee payable for each session you go to. They play a range of wargames and miniatures games, and you can pre-arrange a game on their forum. York University- York University at Heslington has a huge range of societies, including Sci-Fi and Fantasy, Mugglesoc (Harry Potter) which has it’s own Quidditch team, HAZsoc (fighting Zombies with Nerf guns), Fragsoc (PC gaming), Animee, Doctor Who, Douglas Adams and more. Most of them will let alumni (many ex-students stick around, possibly because of job prospects from places like York Science park) and non-students join as well, although you will have to contact the society directly rather than through the yusu.org website. Pokemon Go – Although the popularity for the game has decreased since the game was released, York has a thriving and highly organised Pokemon Go community. There is a Facebook page people can join, and a Discord server where people can co-ordinate raids. It’s not uncommon during the day to see a large group of people with their phones out gathered round one of the towns many gyms when legendary Pokemon are about! No doubt they will be just as organised with Harry Potter Go when that is released. York Geeks and Gamers – A group on Meetup.com that allows fellow geeks and gamers to socialise and play games, they do a variety of events including boardgames, RPGs, Pokemon Go events and socials. It’s free to join, and is specifically there to bring people together. York Geekfest – York Geekfest is a festival created by University of York students which is open to the public on the University campus. It started out quite small but they have been adding more each year. There are traders, shows you can watch, activities you can get involved in, art galleries, demonstrations and animee screenings. The first year was free but I believe it’s only a small fee to get in now. They’ve also had an after party at Fibbers in previous years for a small fee. The Fleeting Quiz- Fleeting Quiz started at the Fleeting Arms community pub (which unfortunately shut down, as it was a nice place to chill out with a PS2 game and have a drink and was on Geek Street Gillygate) and now takes place in City Screen basement. They have different themes each month which are well attended. The more popular franchises take part over two nights due to demand! With all this going on, it’s no surprise York has a high NPSM (nerds per square meter), and that you’ll bump into things like the car below that the residents have created. On our little street with about 60 houses there are two geek cars and a geek moped! In conclusion, with all of this I think York is the geek capital of the UK. Why not come for a visit and see what it has to offer?